If you’ve ever used stat-tracking software like StatsD and Graphite, you may have already heard of InfluxDB. For those who have not, it is a time-series database, useful for tracking data to be aggregated over a period of time. I’ve been using InfluxDB for some time to track a variety of data in my Rails applications. InfluxDB caught my eye because it not only tracked data, but metadata, too. Metadata is anything you might want to use to “scope” your query (that is not time-related). For me, this is the ID of a client in a multi-tenant application for background processing work. To make it easier to use in my Rails applications I wrote a little library called Tremolo which has similar functionality to the Ruby StatsD library. By way of introduction, I would like to show how I leveraged ActiveSupport::Notifications to send my data to InfluxDB using Tremolo. I’ll do this in three parts. 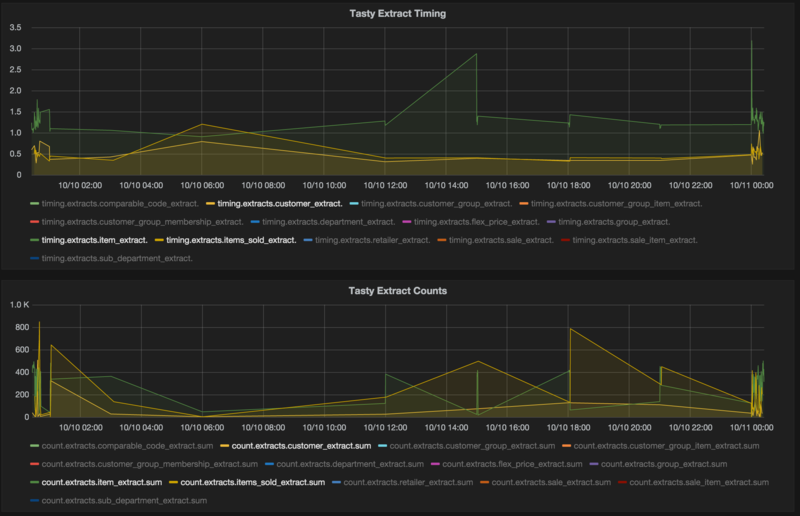 As a bonus, I’ll also give you a peek at what the data looks like graphed on my dashboard, which uses Grafana. Tremolo is a library to send data in InfluxDB’s wireline protocol over UDP, built using Celluloid. Using it is very straightforward. First, we make ourselves a tracker, pointing it at our InfluxDB instance. To send InfluxDB some stats, we use our new tracker. Tremolo also supports decrement, timing with an integer for milliseconds, and most importantly for my examples: time with a block. Now that we’ve got the basics of Tremolo, let’s take a look at what Rails has to offer to make our tracking a bit easier. Rails has some very simple, but handy, functionality to allow us to instrument our code. Elsewhere, we can subscribe to get notifications of when our instrumented code is run. Rails uses this to instrument requests and calls to the database, while also enabling third-party libraries to hook into the system at both ends. ActiveSupport::Notifications has some key features that make it especially well-suited to tie into a stats-tracking library like Tremolo. Let’s take a look at a simple example, making an API call: Note: I’m going to alias ActiveSupport::Notifications as ASN for brevity. Straightforward, and powerful. Let’s make use of this to build some flexible tracking in our application. Inside our subscribe block, we make an event from the args, then get our tracker. Once we have those, we track the timing from our event, using the full name and duration, passing the payload as metadata last. There’s a little more to this one than our timing. First difference is we want to get a value for the count. If none is provided use 1 as a default. We use delete because we don’t want this value tracked into the metadata in InfluxDB. Next we use write_point on our tracker because we’ve got our own value to track. Here are some examples of the things I instrument in my own applications. Though, if it takes time in code, or is of any importance to your business or the functioning of other code, track it! InfluxDB is extremely easy to get installed and running. If you’re on a Mac brew install will get you running, and a simple configuration change will set up a UDP listener. InfluxDB does not, however, have a UI for anything other than querying databases/series with a SQL-esque query language. This is where Grafana comes in. Grafana has installation packages for most linux platforms, but for Mac OS X you’ll need to install from source. This was quick and easy on my system, and required no further (backend) configuration to get running. Just set your data source (influxdb) and go. I’ve found ActiveSupport::Notifications and Tremolo to be a fantastic combo. I hope this article has made it easier for you to get into tracking important data in your own applications. Read more here about ActiveSupport::Notifications and more about Tremolo. If you’re wondering about the name Tremolo, I have a whole series of libraries for integrating stats in a variety of ways, all named for different musical terms. Legato pulls data from Google Analytics, and Staccato sends data to GA using the official tracking API. Tremolo is just the latest in this collection. Check ‘em all out!